We offer wide range of Pharma Machinery. Backed by a team of adroit professionals, we are offering an extensive array of Tablet Counter. This counter is broadly used in pharmaceutical industry. Under the supervision of dexterous professionals, the provided counter is manufactured with the use of optimum class components as well ultra-modern methodology in accordance with set industry guidelines. Furthermore, our clients can buy this counter in different specifications in accordance with their needs at an affordable price. Cap: 100 Tablets.9.5 mm Perforation, provided with a pouring lip and Handle. 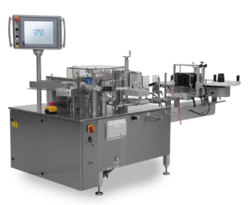 To meet the variegated specifications of our renowned clients, we are engaged in offering a wide range of Amopule Filling Machine. This machine is used for the filling & sealing of glass ampoules. The offered machine is widely uses in pharmaceutical, biotech, cosmetic & chemical industry. While manufacturing this machine, our skilled team of engineers uses premium grade components with the aid of advanced techniques. In order to deliver the defect free range, this machine is properly examined on different parameters by our experts. Motor driven giving ten ampoules per minute. Capacity of filling adjustable from 1ml. to 10.ml. by a cam lever arrangement. AUTOMATIC intake and outflow of fluid. ALL CONTACT PARTS of BOROSILICATE GLASS. The sealing apparatus consists of glass fusing burner for L.P.G. or PETROLLIUM GAS, with FOOT BELLOW and RUBBER TUBING. With an objective to fulfill the demands of our clients, we are engaged in offering a wide range of Strip Packing Machine. This machine is used for packaging of materials. Under the vigilance of adroit professionals, this machine is manufactured using high quality components as well as sophisticated techniques at our sound manufacturing unit. This machine is thoroughly examined against various parameters to ensure its high functionality. 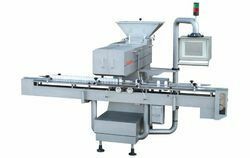 Looking for Pharma Machinery ?